Sharp Park, located on Salada Beach in the San Francisco suburb of Pacifica, shares the distinction with the Eden Course at St. Andrews1 as the world’s only Alister MacKenzie-designed, municipal seaside golf links. Now is the time for the community to come together and preserve this important public recreational legacy for future generations. 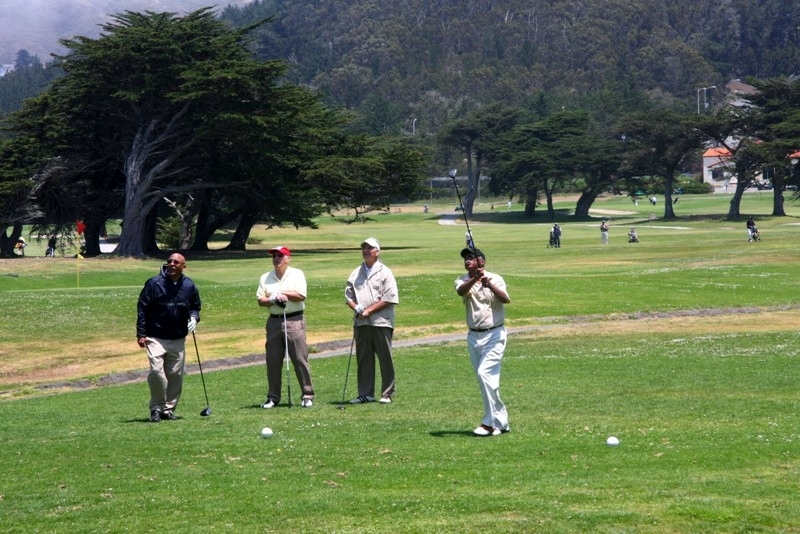 Golf enthusiasts from the Bay Area and around the world, historic preservationists like the Washington, D.C. based cultural Landscape Foundation2, and others who treasure Sharp Park, including public officials from San Francisco, Pacifica, and San Mateo County, are fighting to rescue Dr. MacKenzie’s muni masterpiece. 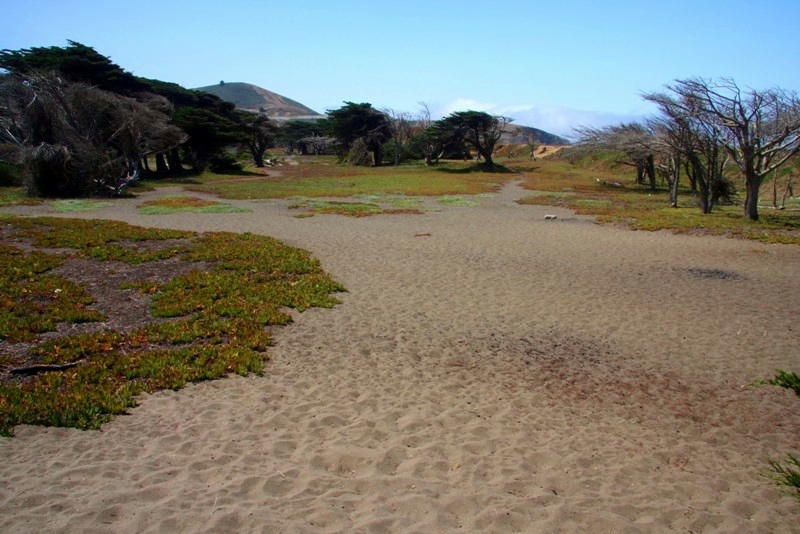 Alister MacKenzie turned these dunes into one of America's great cultural landscapes. 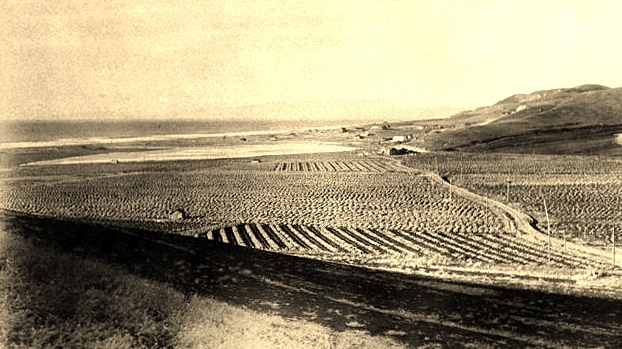 Historic photo of artichoke farm and Laguna Salada. In 1927, when San Francisco’s two existing public courses at Lincoln Park and Harding Park were oversubscribed with enthusiastic golfers, the man who created Golden Gate Park had a brainstorm. Why not build a third course on the land that had been donated by Mrs. Sharp? 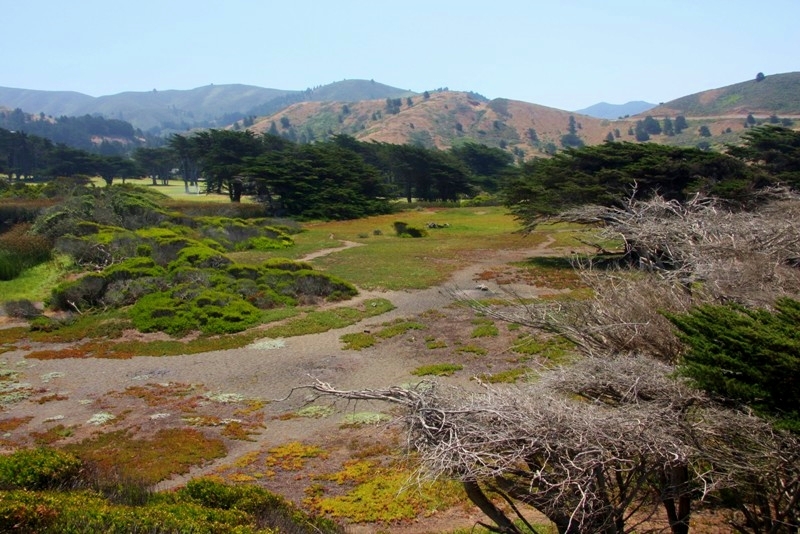 So John McLaren, the legendary steward of San Francisco open space and parkland, floated the idea of a seaside public golf course at Sharp Park. McLaren’s handpicked architect, Dr. Alister MacKenzie (and his firm Hunter & MacKenzie) were selected pursuant to a contingency arrangement of sorts: they would draw up plans for a golf course for no fee; but if the plans were accepted at a later date and the course constructed in accordance with those plans, Hunter & Mackenzie would be retained as the course architects. In late 1930, somewhat after the fact, everything came together. 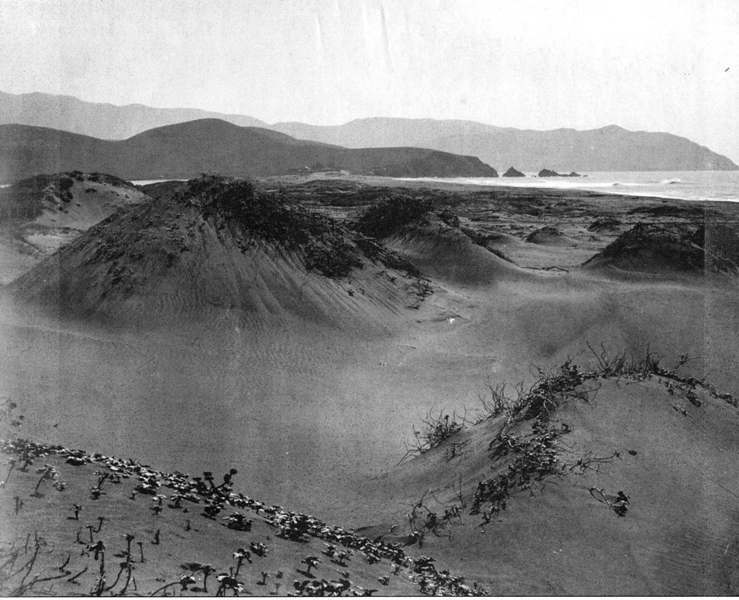 By unanimous vote of the San Francisco Board of Supervisors, Alister MacKenzie was officially hired as the golf course architect for the City’s third municipal course in the dunes at Salada Beach. Dr. MacKenzie’s plans for Sharp Park were completed by 1929. He left construction supervision to the watchful eye of his partner Chandler Egan (two-time U.S. Amateur champion, 1904 Olympic golf silver medalist, and the architect primarily responsible for renovating Pebble Beach for the 1929 U.S. Amateur Championship). 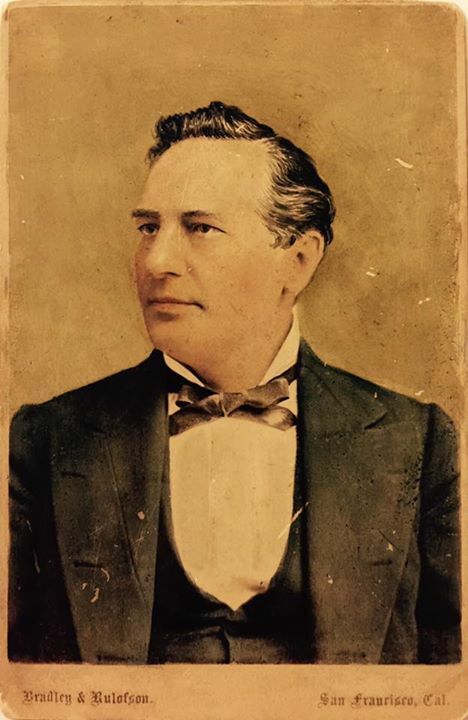 Robert Hunter, Jr. (son of MacKenzie’s long-time partner Robert Hunter, who had by then relocated to Southern California) was retained as the supervisor of construction. Egan and Hunter, Jr. were joined by Jack Fleming, who had been the construction foreman at Cypress Point. Born of Scottish parents in 1870 in Yorkshire, England, Alister MacKenzie received a medical education at Cambridge. He served as a British Army surgeon in the Second Boer War in South Africa in the 1890s and then as a camouflage officer with Royal Engineers in World War 1. He quit the practice of medicine early in the 20th Century and went into partnership in London with H.S. Colt and Charles Allison – the first-ever business dedicated solely to golf architecture. In the United States, Dr. MacKenzie worked primarily in the Midwest (where he built university courses at the University of Michigan and Ohio State, and the great layout at Crystal Downs in Northern Michigan) and Northern California. Indeed, his final resting place is Santa Cruz, overlooking Monterey Bay, 90 miles south of San Francisco, where his ashes were scattered at Pasatiempo, the wonderful up-and-down course he built for Marion Hollins. Bobby Jones played Pasatiempo on opening day in 1929 and it was that experience, as well as the fact that MacKenzie (working again for Mrs. Hollins) had also recently designed the amazing new course at nearby Cypress Point, that caused the game’s greatest amateur (and some say greatest player) to retain MacKenzie to construct Jones’s “dream course,” Augusta National, on an abandoned flower nursery in rural Georgia. But for over 80 years, lucky San Francisco and Peninsula muni players and visitors have had Sharp Park – the Pacific Coast’s answer to North Berwick – a place where a remarkably diverse golfing clientele of all races, languages, social classes, and genders pull their carts, hit their shots, and enjoy a beer and a sandwich in a charming 19th hole pub, for a modest weekday greens fee under $30. 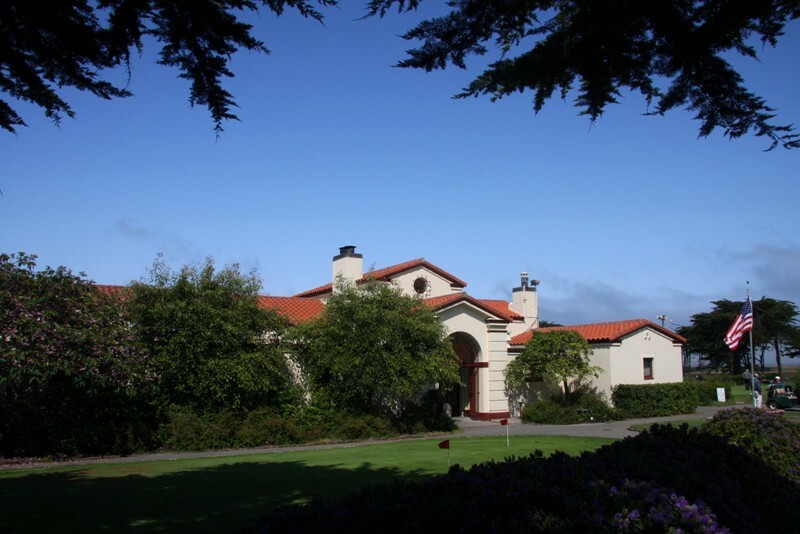 The Spanish hacienda-style clubhouse was a Works Progress Administration construction project, designed by an associate of Willis Polk, who in turn was head of the San Francisco office of Chicago-based master planner Daniel Burnham. In other words, when constructing Sharp Park – in the dark days of the Great Depression – San Francisco went first-class all the way. As for the course design, Dr. MacKenzie made the most of the opportunity handed him by John McLaren. Deploying state-of-the-art machinery and innovative engineering techniques, he dredged the Laguna Salada, converting it from a brackish marsh into a fresh water lake, then set about surrounding the lagoon with golf holes. 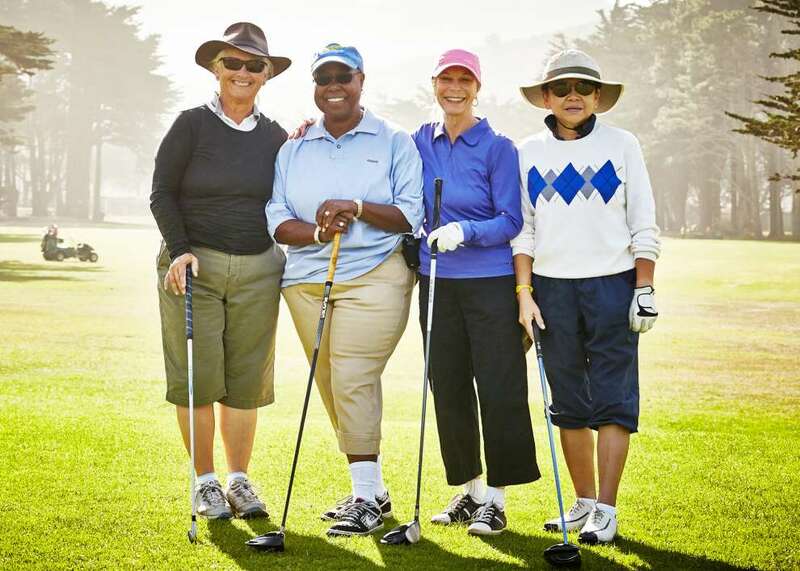 Sharp Park incorporates MacKenzie's prescription that a golf course should be a place of surpassing natural beauty, and that the game should foremost be a fun and healthful pastime, equally playable and enjoyable by persons of all abilities. 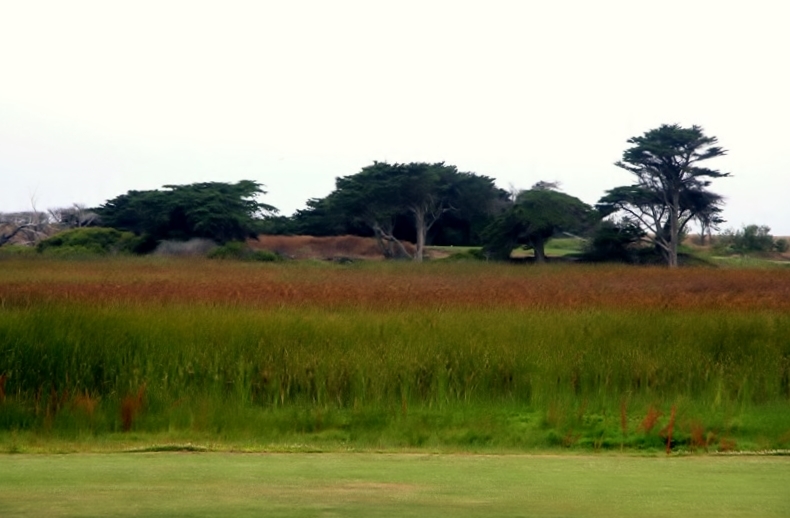 At Sharp Park, MacKenzie combined features in one place that he had scattered over other layouts. His original design included holes featuring multiple tees (Nos. 2, 5, and 14), double fairways (Nos. 5 & 10), cross bunkering (No. 16), fairways in the sand dunes (Nos. 3 & 7) and several holes bordering the inland lake (Nos. 4, 5, 8, 9, 10 and 11). There were tees on spits in the water, and island landing areas. Two of the holes were clearly inspired by MacKenzie’s “Lido Hole” which catapulted him to fame in 1914 when he won a design contest sponsored by Country Life magazine. This sea wall protects the course from the ocean, which is only a wedge shot away. Urban legend long had it that portions of the original course were washed away in the 1930s by powerful winter storms. But in truth, the course weathered the storms until 1941, when the original strand holes (Nos. 3 and 7) were replaced by an unreinforced sea wall, and four excellent new holes were built by MacKenzie’s associate Jack Fleming, who by then had become San Francisco’s supervisor of golf. An aerial photograph taken in March 1941 shows the original course still intact. The picture was taken just prior to the building of Fleming’s four new holes. The new holes were built (following MacKenzie’s death in 1934) in a canyon east of the rest of the golf course, located on the other side of what was then state Highway 1. 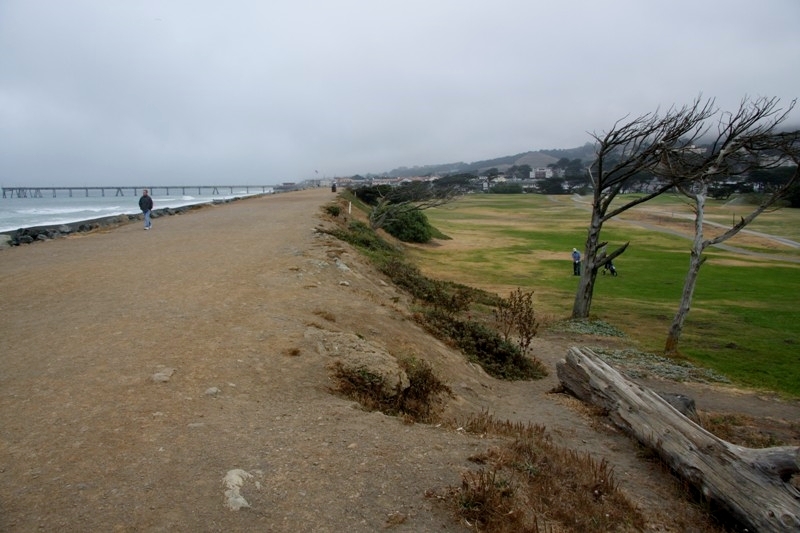 A walking tour of the current course not only reveals the original green contours and the locations of original bunkers, but a detour through the ice-plant strewn sand dunes in the shadow of the sea wall also reveals three of the “lost holes” abandoned in 1941 when the new holes were built east of Highway 1. Overarching the design details at Sharp Park is MacKenzie’s beautiful landscape architecture. 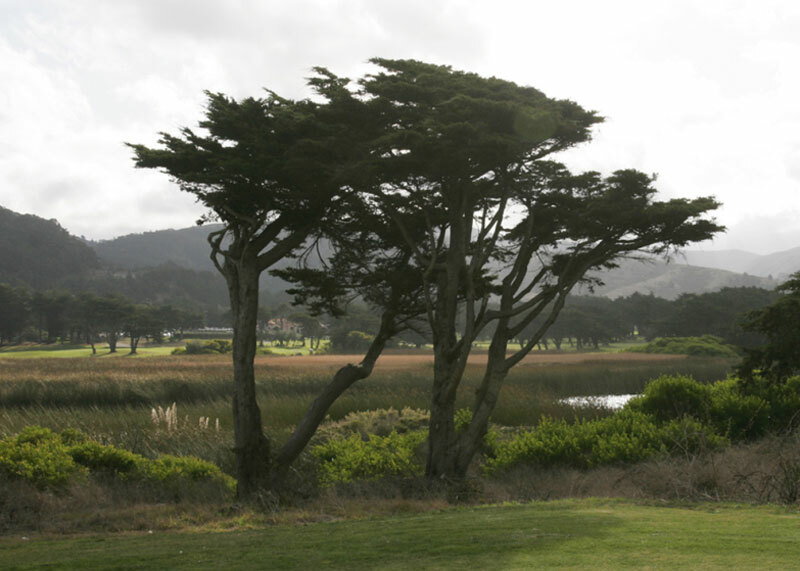 The Monterey Cypress that define several fairways 20 frame picturesque views of the mountains and headlands surrounding the low-lying golf course. It is as if the Good Doctor had set the fortunate golfer down in the middle of an early 19th Century English romantic landscape painting by John Constable. Portions of the original 4th and 8th holes. Sharp Park is a public golf companion piece to the Golden Gate Bridge, a monumental engineering and artistic feat, created in the depths of the Great Depression by a great artist, to inspire and uplift the public spirit. If a golf course with Sharp Park’s historic legacy and devoted multicultural clientele can be destroyed by a combination of anti-golf prejudice and over-aggressive use of the Endangered Species Act, no golf course is safe. 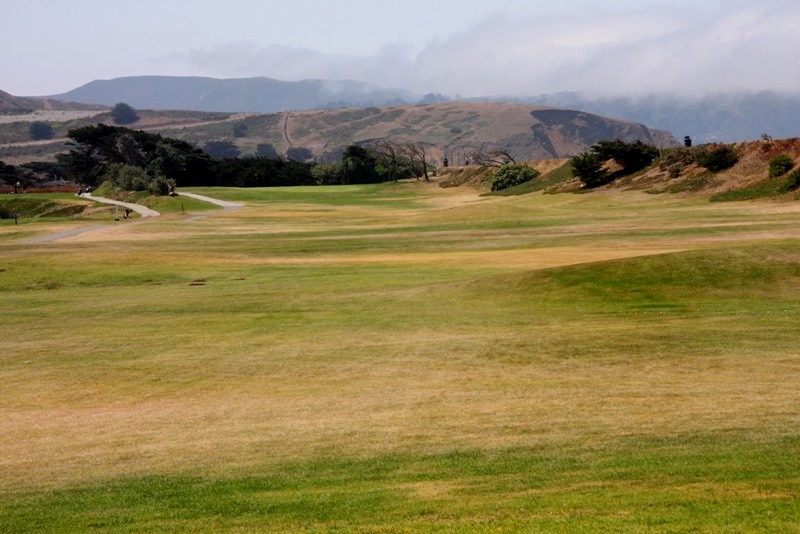 For these reasons, the San Francisco Public Golf Alliance solicits the support of golfers everywhere to save this municipal golf masterpiece. “Landslide,” The Cultural Landscape Foundation, “Alister MacKenzie’s Sharp Park,” July, 2009. Williams & Associates, “Laguna Salada Resource Enhancement Plan,” ( June, 1992) , at pp.2-3, and Fig. 2. “H. Chandler Egan Praises Possibilities of Sharp Park Golf Links” (sub-head: “New Municipal Course Ideal Claims Expert”), San Francisco Chronicle, February 26, 1930, page H-3. “Appropriation For Third S.F. Golf Course Receives Okeh,” San Francisco Examiner, February 22, 1930, page 15. “New San Francisco Course Opens,” San Francisco Examiner, April 16, 1932, page 17. Shackelford, “Sharply Divided,” Golf World, July 20, 2009, at p. 31. “Tee Topics” (sub-head: “Here’s What You’ll Find at Sharp’s [sic] Park - Fleming Describes City’s Newest Layout”), San Francisco Call-Bulletin, March-April 1932. The hole-by-hole descriptions are linked here.